HelloTensorFlow aims to be a collection of notes, links, code snippets and mini-guides to teach you how to get Tensorflow up and running on MacOS (CPU only), Windows 10 (CPU and GPU) and Linux (work in progress) with zero experience in Tensorflow and little or no background in Python. It also runs through some basic machine learning code and concepts and focuses on specific details of TensorFlow as they are seen for the first time. This project assumes you are familiar with the command line, git and the most common developer tools of your chosen operating system. The code samples can be run in the console as is the most common scenario, but I also show how to set up Eclipse and the PyDev developer environment for Python motivated by my need for a cross platform IDE with code highlighting and other helpful IDE tools. Many of the code examples have been taken from other Internet resources and credit is always given. We welcome pull requests for corrections, updates or additional tips, etc. Before following along, take the time to read the Dev4Windows.md or Dev4MacOS.md to get things setup and installed and make sure you can successfully run hellopy.py and hellotf.py as well as some examples from the Tensorflow/models repo from the command line as well as from within Eclipse. The referenced dev instructions are also pasted in this blog post at the end of the walk through. The following 4 python (*.py) files are located in src and were adapted from Basic Concepts and Manipulations with TensorFlow. Reading the blog post, going through the code and comments and running the programs will familiarize you with the simplest Tensorflow concepts. At this point we can leverage the project called TensorFlow-Examples to learn more M.L. in Tensorflow concepts. Go ahead and clone that repo and try running some of the examples either in the console or in Eclipse. At this point, you could also use the Jupyter Notebook IDE for working with the examples, as it provides many nice conveniences although I’m quite happy with my Eclipse IDE setup. Logistic Regression is like Linear Regression except it allows you to classify things rather than predict a continuous value. In logistic regression, the hypothesis function is the sigmoid function. The sigmoid function is bounded between 0 and 1, and produces a value that can be interpreted as a probability. This value can also be a yes / no answer with a cross-over, or decision boundary, at 0.5. The cost function is also changed from Linear Regression to be more compatible with gradient descent. The output is thresholded for a single class classifier and the softmax algo is used for a multi-class classifier. A Tensor. Must be one of the following types: int32, int64. int32 or int64, must be in the range [-rank(input), rank(input)). Describes which axis of the input Tensor to reduce across. For vectors, use axis = 0. In this case we have a matrix with rows representing the softmax score vector of the 10 digits for each test image. Axis = 0 refers to rows, axis = 1 refers to columns. For K-Means clustering, the concept is really simple. You pick K centroids and randomly place them. In a loop, you calculate the N closest datapoints to each centroid and calculate the average centroid location. Repeat until it converges. This converges to a local minimum so it is not at all perfect. How would I implement k-means with TensorFlow? Ignore all GPUs, tf random forest does not benefit from it. I think I read somewhere it’s even better to set it to -1. If you don’t set this and there is a GPU on the system it will run it on the GPU. This forces it to use the CPU. In this example there is no training at all. You just give it a test image and all the “train” images and it sees which one it is closest to. This demo uses the tensor_forest from the tf contrib package. It forms 10 trees, using the individual pixels as features. Each branch in the tree looks at the pixel values and makes a decision: left or right. The number of nodes in the trees is sqrt(numFeatures), and each node gathers statistics about the data it sees in order to determine an “optimal” threshold value for the decision. The outputs of all 10 trees are averaged to determine the combined classification output of the entire forest. Again, here we ignore all GPUs, tf random forest does not benefit from it. Here the model is saved to disk and then restored later for inference use. It looks like the saving needs to be implemented in the Model itself. saver = tf.train.Saver() // saves all variables, you could specify which ones. Checkpoints are binary files in a proprietary format which map variable names to tensor values. Savers can automatically number checkpoint filenames with a provided counter. This lets you keep multiple checkpoints at different steps while training a model. 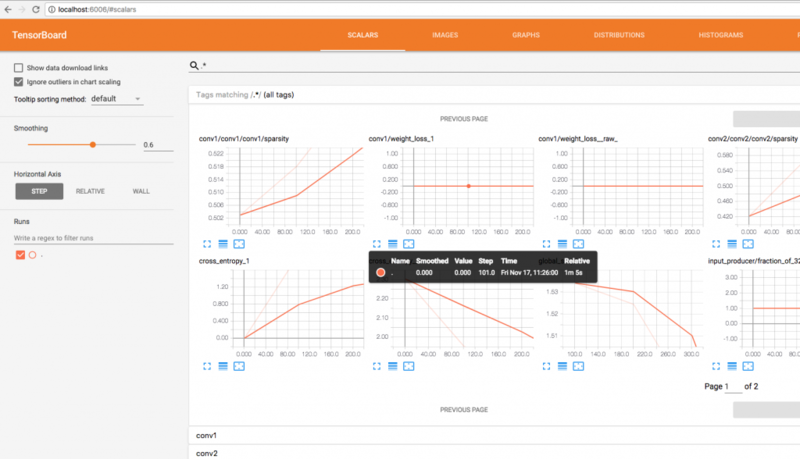 Tensorboard allows you to view the graph as well as model parameters, updating live. Grouping nodes by name scopes is critical to making a legible graph. If you’re building a model, name scopes give you control over the resulting visualization. The better your name scopes, the better your visualization. When the serialized GraphDef includes tensor shapes, the graph visualizer labels edges with tensor dimensions, and edge thickness reflects total tensor size. To include tensor shapes in the GraphDef pass the actual graph object (as in sess.graph) to the FileWriter when serializing the graph. Often it is useful to collect runtime metadata for a run, such as total memory usage, total compute time, and tensor shapes for nodes. The code example below is a snippet from the train and test section of a modification of the simple MNIST tutorial, in which we have recorded summaries and runtime statistics. See the Summaries Tutorial for details on how to record summaries. When you launch tensorboard and go to the Graph tab, you will now see options under “Session runs” which correspond to the steps where run metadata was added. Selecting one of these runs will show you the snapshot of the network at that step, fading out unused nodes. In the controls on the left hand side, you will be able to color the nodes by total memory or total compute time. Additionally, clicking on a node will display the exact total memory, compute time, and tensor output sizes. This code will emit runtime statistics for every 100th step starting at step 99. 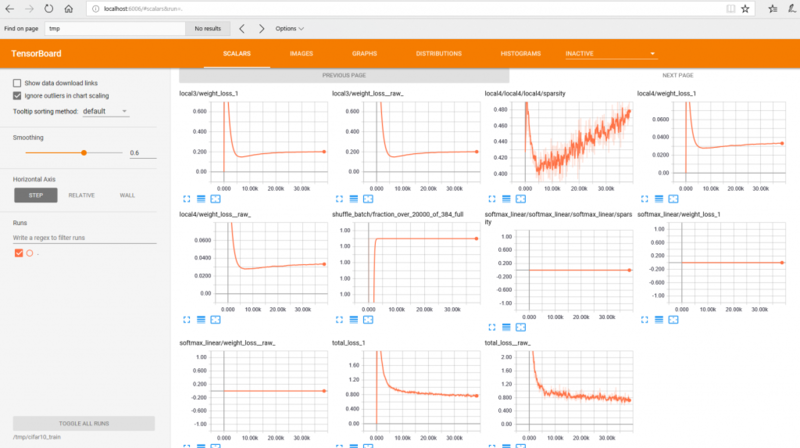 We can do some amazing data mining, insight and comparison with TensorBoard. Also, we should be able to debug stuff like Nans Infs and Tensor shapes and data soon if not yet already. build_an_image_dataset.py – create a custom image dataset. multigpu_basics.py – how to assign different parts of the graph to different GPUs. Create a directory called workspace_tf somewhere. Create a workspace pointing to workspace_tf. Install PyDev in Eclipse. 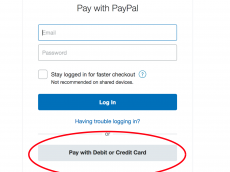 Help ==> Install new Software… Click on Add… then PyDev in Name and http://pydev.org/updates/ in Location. Select PyDev and click through the wizard. # To print the value of constant you need to start a session. 2017-11-17 10:33:55.587159: W tensorflow/core/platform/cpu_feature_guard.cc:45] The TensorFlow library wasn't compiled to use SSE4.2 instructions, but these are available on your machine and could speed up CPU computations. 2017-11-17 10:33:55.587179: W tensorflow/core/platform/cpu_feature_guard.cc:45] The TensorFlow library wasn't compiled to use AVX instructions, but these are available on your machine and could speed up CPU computations. 2017-11-17 10:33:55.587188: W tensorflow/core/platform/cpu_feature_guard.cc:45] The TensorFlow library wasn't compiled to use AVX2 instructions, but these are available on your machine and could speed up CPU computations. 2017-11-17 10:33:55.587192: W tensorflow/core/platform/cpu_feature_guard.cc:45] The TensorFlow library wasn't compiled to use FMA instructions, but these are available on your machine and could speed up CPU computations. Alternatively, import the models project into Eclipse as described above for HelloTensorFlow, right-click tutorials/image/mnist/convolutional.py ==> Run As ==> Python Run. Open http://localhost:6006 in browser to view tensorboard. Running 5000 steps on the CPU took 57 minutes. Configure PyDev in Eclipse preferences to point to installed Python executable. Go to Window ==> Preferences ==> PyDev ==> Interpreter - Python Select Qucik auto-Config and it should find python automatically. This adds all the correct paths to the $PATH. Nvidia recommends installing Visual Studio so why not? Will come in handy later if developing GPU code. The official Tensorflow 1.4 builds require CUDA 8 and CuDNN 6, so don’t install the latest and greatest. Follow install [instructions] 1-3 (http://docs.nvidia.com/deeplearning/sdk/cudnn-install/index.html) (adapt for CUDA 8 and CuDNN 6) Follow additional instructions later for CuDNN dev, but not needed for TF. Running on the CPU took 25 minutes, while running on the GPU took 14 minutes. Open the link it gives you in browser to view tensorboard. Running 5000 steps on the CPU took 28 minutes, while running on the GPU took a little over a minute for a 19.7x performance increase!